Example o an Ishihara colour test plate. Dependin on the computer displays, fowk wi normal veesion should see the nummer "74". 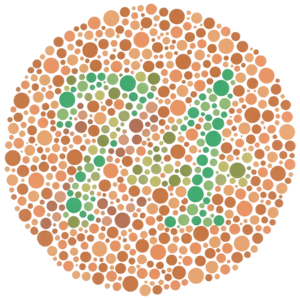 Mony fowk wha are colour blind see it as "21", an thae wi tot colour blindness mey naea see ony nummers. Colour blindness, an aa kent as colour veesion deficiency, is the decreased ability tae see colour or differences in colour. Colour blindness can mak some eddicational activities difficult. Buyin fruit, pickin cleidin, an readin traffeck lichts can be mair challengin, for ensaumple. Problems, houever, are generally minor an maist fowk adapt. Fowk wi tot colour blindness, houever, mey an aa hae decreased veesual acuity an be uncomfortable in bricht environs. ↑ Gordon, N (March 1998). "Colour blindness". Public health. 112 (2): 81–4. doi:10.1038/sj.ph.1900446. PMID 9581449. ↑ 2.0 2.1 "Facts About Color Blindness". NEI. February 2015. Retrieved 29 July 2016.